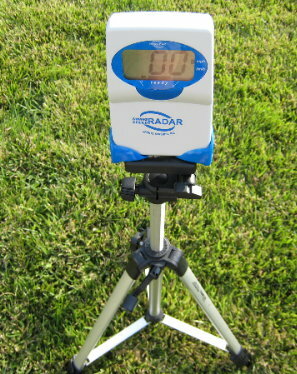 The Swing Speed Radar can be positioned in front of the batter or behind the batter. The most important consideration in using the Swing Speed Radar is to position it in the plane of the swing as the bat enters the hitting zone, similarly to positioning a ball at the desired height and location on a tee. 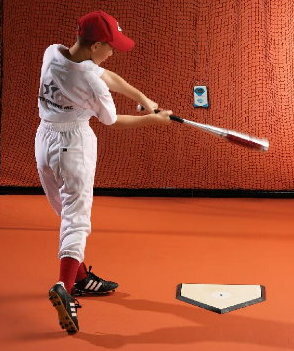 If the batter is swinging in air without a ball, the Swing Speed Radar can be located forward about six feet in front of the hitting zone, at the height of the bat swing through the hitting zone. The radar can be mounted on a tripod or hung on a net or fence. The batter is now swinging toward the radar as though it were the ball coming from the pitcher. If the batter is swinging at a ball on a tee, the Swing Speed Radar must be located behind the batter to prevent the batted ball from striking the radar and/or erroneous reading caused by the unpredictable ball flight from the tee. The radar should be about six feet behind the tee, facing the ball on the tee and at the height of the ball. The radar must be sufficiently rearward, where a catcher would ordinarily be positioned, to prevent it from being struck with the ba. In this location, the batter is swinging away from the radar. The Swing Speed Radar radar will not give false readings like other radar units. When a ball is hit off of a tee, your true bat speed readings will accurately be displayed. Most hand held radar units measure the maximum bat speed attained at any point during the swing. 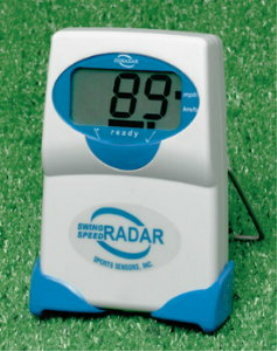 Swing Speed Radar can be set-up to record bat speed attained at contact. Click Here for an article on why maximum bat speed at contact is so important. Swing Speed Radar works with all bats, including aluminum, graphite and wood. Easy to use. Just turn it on and it will give a reading every time. When you are finished, it will automatically shut off. The Swing Speed Radar will accurately measure your club head speed consistently and within 1 mph.